Blackstone Models is proud to announce the release of six new road numbers of this classic stock car in both weathered and non-weathered paint schemes. Of the various rolling stock seen on today’s modern railroads, one car style is now conspicuously absent. The classic stock car (or “cattle car”) was once a mainstay of American railroad equipment in the era of livestock rail transportation. The narrow gauge Denver & Rio Grande Railroad in Colorado was certainly no exception. A healthy stock car fleet was a vital part of the railroad’s ability to serve customers by keeping cattle, sheep, and other live commodities moving to market. By the early 1900’s, the D&RG narrow gauge was feeling the maintenance burden of supporting an aging rolling stock fleet consisting of various car styles dating back to the early 1880’s. Years of deferred rolling stock maintenance in the 1890’s exacerbated the growing need to repair or replace much of this equipment. Simultaneous with the railroad’s mass scrapping of the worn out 19th century stock cars around 1904, 350 new stock cars were ordered from American Car & Foundry and numbered 5500 to 5849. They came at a cost of $685.99 each and were financed through a New York bank along with 1700 other narrow gauge cars purchased in the same order. Arriving by the spring of 1904, these thirty-foot 25-ton capacity cars became the mainstay of the D&RG livestock cars. Many of them were eventually modified with a middle deck on the inside to accommodate larger loadings of sheep and other small livestock. 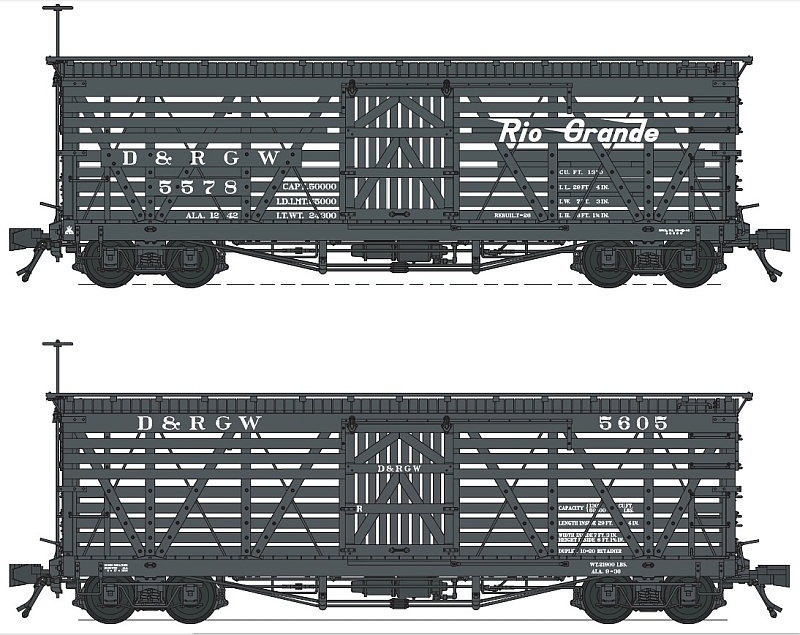 In 1926 these 5500 series cars were extensively rebuilt by the D&RGW (the railroad changed from Denver &Rio Grande to Denver & Rio Grande Western as a result of company re-organization in 1921) with much of the wood being replaced and slightly re-designed to reflect updated specifications. At cost of $477.00 per car, this 1926 re-build would reflect the final time period that the D&RGW spent this amount of money and resources for one project on its narrow gauge rolling stock fleet. Replace friction side bearing with roller, bolster center filler, striking castings, carlines, steel end applied, side door track hanger and hasps. With the gradual decline of narrow gauge rail traffic in the 1940’s and 50’s, the use of the thirty-foot stock cars began to drop off. 308 of them were still showing on the company books in 1954. Due to poor maintenance throughout the 1950’s and 1960’s, the remaining stock cars’ condition slowly deteriorated up to the end of D&RGW narrow gauge mainline operations in 1968. In 1970, many of the cars were sold to the same salvage company responsible for scrapping the D&RGW narrow gauge lines from Alamosa to Durango, CO and Farmington, NM. Over 100 other stock cars were dismantled around this time period. Today, less than 100 of these once familiar cars survive in various conditions. Some fine examples of surviving and well-restored cars exist in Chama, New Mexico on the Cumbres and Toltec Scenic Railroad. Thanks to the volunteer group, Friends of the C&TS, many narrow gauge cars are in the process of restoration to this day. The HOn3 version of the D&RGW 5500 Series Stock Car is factory painted, and ready to run. The Blackstone Models version represents the single deck style of the cars after the 1926 rebuild. They have utilized D&RGW standard specifications and remaining prototypes in an effort to create a detailed stock car that will please the discriminating modeler. Appearance features such as accurately placed and scaled hardware, underbody detailing, and fine nut and bolt applications place the Blackstone Models 5500 Series Stock Car in an exclusive class of its own. Cap everything off with their free-rolling arch bar trucks, and Kadee® couplers, and all you need to do is pull it out of the box and cut it into your consist! Nos. 5578 and 5669 are painted a gloss black, simulating the look of a freshly shopped stock car. Nos. 5510, 5723 and 5825 are available in a flat black matte, simulating some very light aging of the paint. All can be additionally ordered as weathered versions. B2/3 body style represents the D&RGW stock car after the 1926 rebuild and prior to the Flying Grande Herald. This style was applied in the late 1920s and the 1930s, with many lasting well into the 1940s. Blackstone Models has announced one additional road number in this style, No. 5605, available painted a gloss black 'freshly shopped' or as a weathered version of the same.